This tutorial covers basics of using ChimeraX virtual reality to view DICOM medical imaging data. It assumes you have the necessary equipment for virtual reality already installed and set up for the room. ChimeraX works with virtual reality (VR) systems supported by SteamVR, such as HTC Vive, Oculus Rift and Samsung Odyssey headsets. 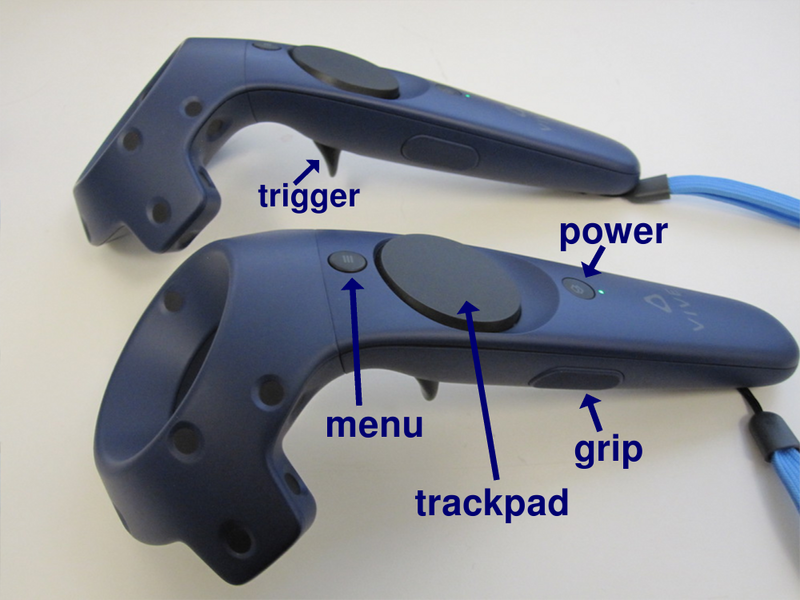 Descriptions below are for Vive hand controllers, but other hand controllers have buttons that are generally similar in position and function. Other than the manipulation in VR, however, the tutorial can be done without VR just using your computer and mouse (or trackpad) instead of a headset and hand controllers. Clark K, Vendt B, Smith K, et al. The Cancer Imaging Archive (TCIA): Maintaining and Operating a Public Information Repository. Journal of Digital Imaging. 2013; 26(6): 1045-1057. The data have been anonymized and are freely available. This sample data folder should be downloaded and unzipped. Although this tutorial does not include clinical analysis, a significant feature of the scan is a tumor in the right lung. Just one Z-plane is shown initially. The Volume Viewer tool shows a histogram of the data with plane as the chosen display style. Below the histogram is a slider for viewing different planes along Z. Try dragging the slider. The tumor in the right lung can be seen at approximately Z-planes 146-185. The small squares connected by a yellow line on the histogram are thresholds, the control points for mapping values to colors and intensities. They can be moved by dragging in the Volume Viewer histogram, and added and deleted using the context menu (right-click or Ctrl-click depending on platform). Click-drag the middle threshold and see how the display changes as you drag it in any direction. In virtual reality, the hand controllers are used to click icons and move models. There is currently no virtual keyboard in VR for typing commands. Show the Density Map Toolbar of icons that act on volume models (menu: Tools... Toolbar... Density Map Toolbar). Hide sets of icons not needed for this tutorial (in menu: Tools... Toolbar, uncheck Graphics Toolbar and Molecule Display Toolbar). Take a moment to look at the hand controllers: Vive controllers each have a trigger to “pull” with the index finger, a grip button on the side, and a larger round trackpad on the top surface that can be pressed with the thumb. Above the trackpad is a smaller menu button marked with horizontal lines, and below it is a power button and a green light indicating when the controller is turned on. Buttons on other controllers are similar. On the screen, you can see that the icon bars have been moved to the right side of the graphics window. In the process, other tool panels may have been vertically compressed; drag to make the Volume Viewer panel tall enough to show the full height of the histogram. Put on the headset, and try moving the model. The hand-controller positions are shown in the headset as cones, and icons on the cones indicate button assignments. Continue moving the model as you wish throughout the tutorial. It is important to avoid flickering in the VR headset, as this may cause severe and long-lasting nausea. Flickering generally indicates that rendering is too slow to keep up with head movements or other changes in the scene. Rendering planes or a cropped volume is faster than rendering the full volume. Another way to decrease computational demands is to subsample the data; clicking changes to step 2 (using half as many points in each dimension), whereas clicking returns to full resolution. Step size may increase automatically when the amount of data displayed increases, but it can still be adjusted manually. Click the menu button to show the ChimeraX control panel in the headset. The control panel is just the set of tool windows to the right of the graphics window in the desktop view, including icon bars. In VR, it can be moved around with the menu button pressed, or hidden by just clicking the button again. A Density Map icon can be clicked with any controller button (trigger, trackpad, or grip) to give the same result. Clicking a Mouse Modes icon with a trigger, trackpad, or grip button assigns whichever button was clicked to the corresponding function. An icon will pop up slightly when the cone tip is in position to click it. Leaving triggers with their default movement modes (rotation, translation, zooming) is recommended, but up to four other functions can be assigned, to the grip and trackpad on each controller. If a trigger is accidentally reassigned, using it to click either the rotate or translate mode icon returns it to the default behavior. Click the move planes mode icon with the trackpad button on one of the controllers. With the same trackpad button, click the plane and drag to show different planes along the axis. This automatically shows an outline box. Click to show the full volume. Although you could return to Z-planes by clicking , the following method works for all three axes. 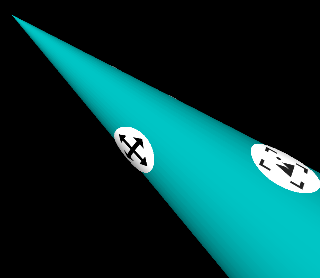 Using the triggers to reorient the display as needed, click with the trackpad button (still assigned to move planes) on any face of the box and drag to view planes along the axis perpendicular to that face. Desktop view including the VR scene in the graphics window: orthoplanes, control panel, and cones with icons for current mode assignments. Now the same trackpad button (still assigned to move planes) works to view the different planes along any of the axes, depending which plane is clicked and dragged. With 3D display, cropping is useful for hiding data that may obscure or distract from a region of interest. Click to return to the full volume. Click to use step 1, full resolution. 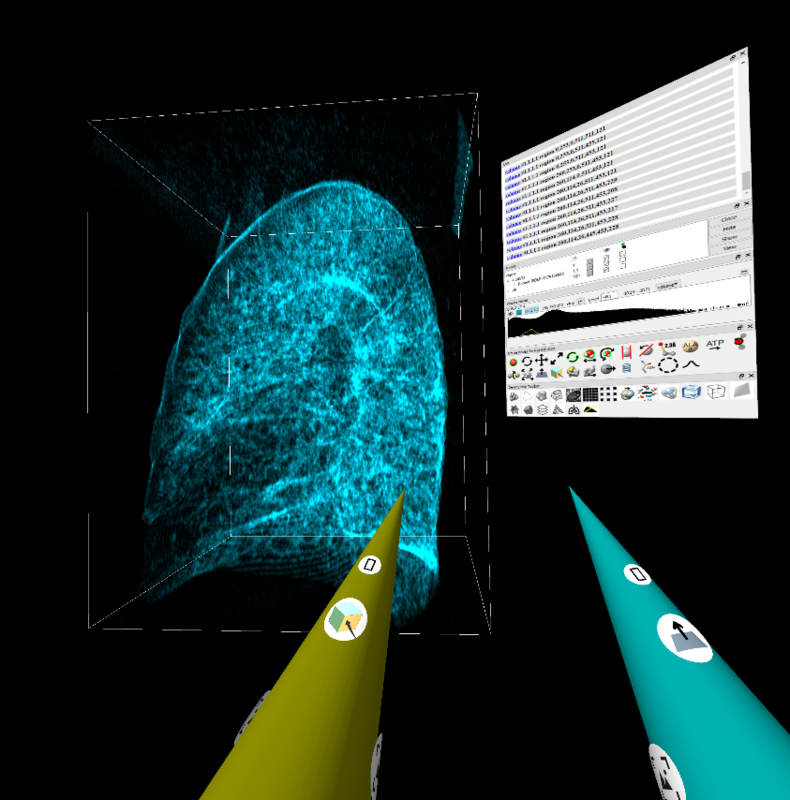 Click to apply the “Airways II” 3D preset (threshold settings) for viewing lung tissue. 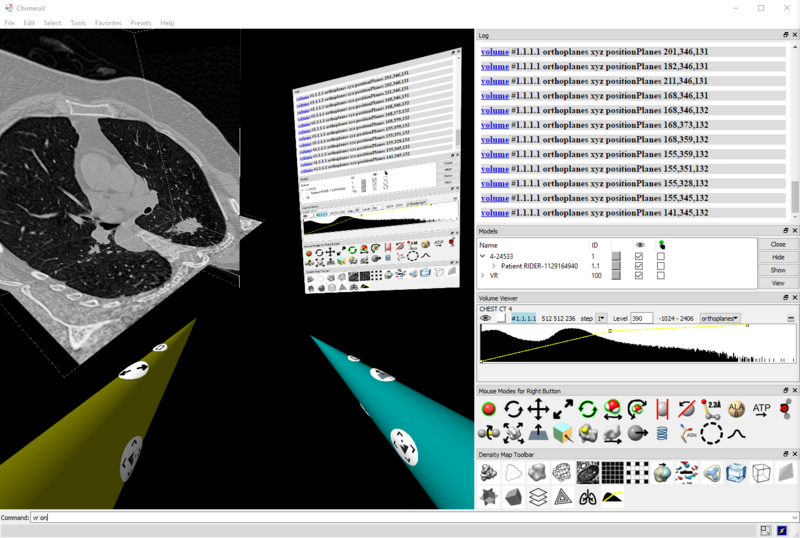 The 3D presets are based on definitions in the Horos program for medical image visualization and analysis. Several are available from the command line, but only “Airways II” is currently available as an icon. If you later go back to viewing planes or thin slabs, it may be helpful to restore the initial thresholds by clicking . Click the crop volume mode icon with the trackpad on one of the controllers. Using the triggers to reorient the display as needed, click and drag any face of the box with the same trackpad button to crop the volume. For example, crop away the chest wall for a clearer view of the lungs, or crop to enclose just one lung. You can click any box face and drag in either direction (making the box smaller or enlarging it back to original size). This automatically shows an outline box. Clicking toggles the outline box on and off. Crop the volume to a slab shape using the trackpad (still assigned to crop volume). Now reassign the trackpad (or assign the trackpad of the other hand controller) by clicking it on the move planes mode icon . Individually by dragging in the Volume Viewer histogram with any button (trigger, trackpad, or grip), although this can be quite difficult. To properly place the cone tip in 3D, it may help to first pierce the panel, then draw back slightly. Click the windowing mode icon with the trackpad on one of the controllers. See what happens to the volume display as you move that controller with the trackpad pressed. Using this mode, vertical motions shift all the thresholds in parallel to higher or lower values (left ↔ right on the histogram) and horizontal motions move the thresholds symmetrically farther apart or closer together (broadening or narrowing their range of values). The threshold positions on the histogram do not update until the button is released. If you want to return to the “Airways II” threshold settings, click . For settings better suited to planes or thin slabs, click .